The Outdoor Camera Enclosure with Heater and Fan (model TV-H510) protects TRENDnet Internet security cameras from extreme temperatures and severe weather with a built in automated heater and fan and an IP66 weather rating. 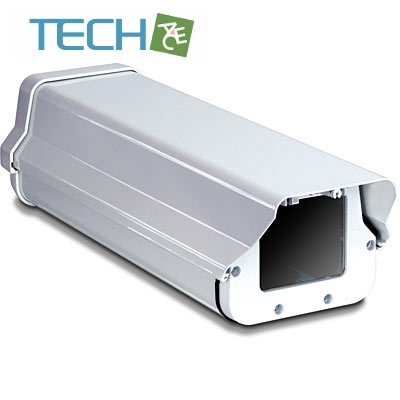 This durable aluminum enclosure is designed for use with compatible TRENDnet Internet security cameras. Mount the enclosure on most surfaces with the included mounting kit. The enclosure’s final fixed position can be adjusted 360 degrees left-to-right, 40 degrees below horizontal and 15 degree above horizontal. A rugged aluminum visor minimizes reflective solar glare, a hinged swivel-top provides full access to the inside of the enclosure, an access latch-design capable of accepting a padlock (sold separately) protects against camera theft and an easy-install camera mount system reduces IP camera installation time.